Simon Begg was made a life member of the ARSV at the last AGM in Adelaide. 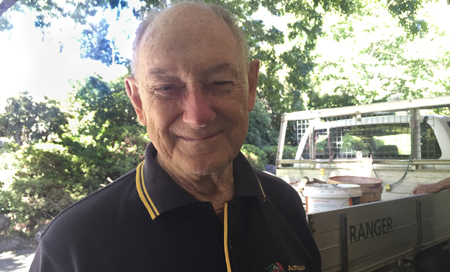 He has been making major contributions to the ARS Victorian Branch since he joined in 1992. He is now President of the National Council. He single handedly shifted the culture in the society away from collections being tightly held, to a higher purpose of making species and hybrids available to anyone interested in them, thus making a lasting contribution to safeguarding many species and hybrids in Australia. As an exhibitor he has collected innumerable prizes and trophies, keeping rhododendrons in the public gaze. ARS 2012 trip to North Queensland where members had the opportunity to see a number of different populations of R. viriosum and R. lochiae in the wild. One of his outstanding contributions has been his engagement with AQIS in rationalising and expanding the list of Rhododendrons permitted for importation. 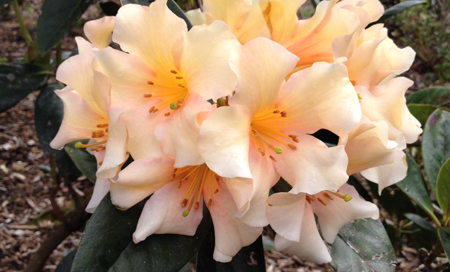 His work has benefited all Australian rhododendron enthusiasts.